Thieves risk their lives to steal railway cables, which brings them little financial reward but costs taxpayers millions each year and causes misery for rail passengers. When a live cable is cut, it can cause a power failure on the network, turning all signals powered by the damaged cable to red and bringing trains to a standstill. 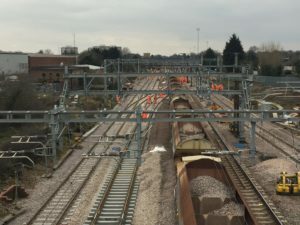 This makes it safe for passengers and teams on the track investigating the problem, but can lead to lengthy, frustrating delays while engineers repair or replace the cable. One theft, which took place on a particularly busy part of the rail network in Wales and Borders last year, affected 387 train services and caused a combined total of 4,532 minutes of delay. Network Rail works closely with partners Arriva Trains Wales and the British Transport Police to minimise disruption to passengers, and find those responsible. British Transport Police officers have increased patrols near the railway, meaning they are able to respond quickly to incidents of theft. Network Rail also protects cable with forensic marking agents, making it easier to track down criminals and secure prosecutions. However, with over 1,500 miles of railway in Wales and Borders, when thieves do steal cable it has a huge impact on passengers and the rail industry is appealing to passengers and members of the public to contact British Transport Police if they notice anything suspicious on or near the railway. “Cable theft is not a victimless crime – far from it. Train delays and cancellations directly affect people going about their daily lives, such as getting to and from work and visiting family. “With more passengers travelling on our network than ever before, even a small delay can have a huge impact on the network. We work closely with our partners Arriva Trains Wales to minimise disruption when incidents do occur, but crimes like cable theft cause unnecessary delays to passengers at an incredible cost to the rail network.